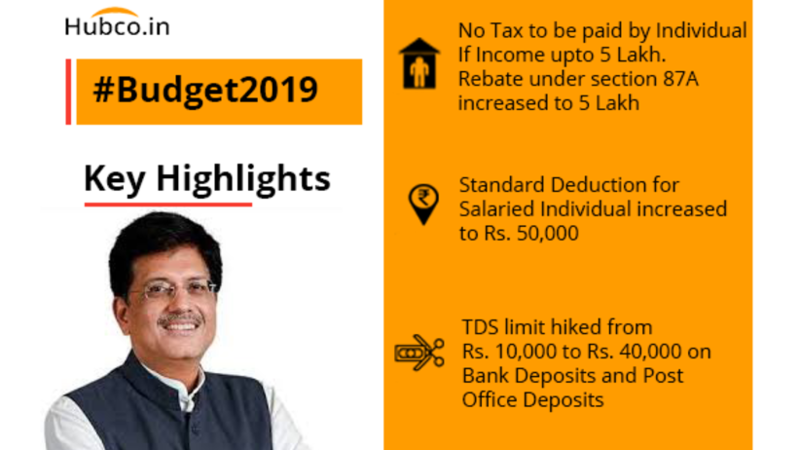 This rebate is only for those individuals having net taxable income upto Rs 5 Lakhs and if taxable income crosses the limit of Rs 5 Lakhs then tax has to be paid according to regular existing tax slab rates of 5%, 20% and 30% plus cess and surcharge. It is to be noted here that this rebate is on net taxable income upto Rs 5 Lakhs and not on the gross total income. That means if an individual is having gross total income then he/she can do tax saving investments to reduce the gross total income to the level to claim this rebate. Gratuity limit has been increased from Rs 10 Lakhs to Rs 30 Lakhs. TDS limit on Post Office Savings and Bank Deposits under Section 194A increased from Rs 10,000 to Rs 40,000 for individuals aged upto 60 years. TDS limit on rent under Section 194I increased from Rs 1.8 Lakhs to Rs 2.4 Lakhs. Upto two self- occupied house properties can be considered for exemption. That means there is no need to pay tax on rent of second self-occupied house under the head “Income from House Property”. Exemption under Section 54 in case of capital gain on sale of house property is increased from investment in one residential house to that in two residential houses, for a taxpayer having capital gains upto Rs 2 Crores. Further, this exemption can be exercised only once in a lifetime. Benefits under Section 80-IBA to be extended for 1 more year, for all housing projects approved till 31 March, 2020. Period of exemption for tax levy on notional rent on unsold inventories of housing projects is extended from one year to two year, starting from the end of the year in which the project is completed. Business with less than Rs 5 Crores annual turnover will be allowed to file GST returns quarterly. GST registered MSME units will get 2% interest rebate on loan of Rs 1 Crore. The Government contribution has been increased from 10% to 14% under National Pension System (NPS) rules. Government to provide assured monthly pension of Rs 3,000 with a contribution of Rs 100 per month after the age of 60 years. 2% interest subvention to farmers pursuing animal husbandry and fisheries. An additional 3% interest subvention will be provided for timely loan repayment. Under Pradhan Mantri Kisan Samman Nidhi, Rs 6,000 per year for each farmer, in three instalments, to be transferred directly to farmers’ bank accounts, for farmers holding less than 2 hectares land. We have tried to summarise the key highlights as much as we can, please let us know your inputs and views on these proposed highlights by the government In the comment section. We have a team of professionals who can assist you in solving your queries. If you have any query then kindly post here or you can also drop your query at info@hubco.in.